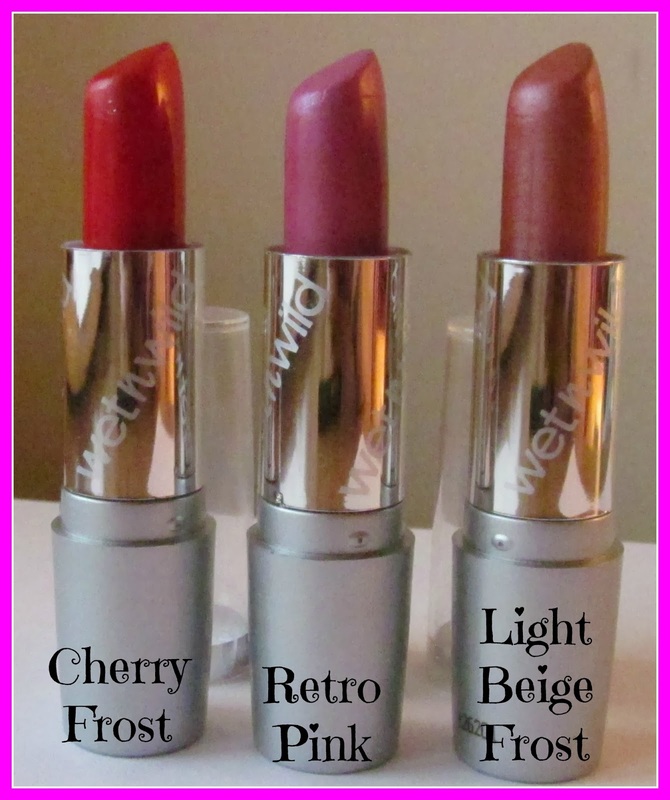 I mentioned in my review of the Wet n Wild Mega Last Lip Colors that Wet n Wild offer another lipstick line but that I did not like it as much as the Mega Last Lip Colors. I haven't yet picked up any of these since Wet n Wild hit Irish shores- I bought these three online over the last few years but two of them are available in your local Dunnes Stores and they will only cost your wallet a measly €1.99. Whereas the Mega Last Lip Color formula is almost too dry, I feel like these are at the opposite end of the spectrum and are a little too wet for my personal preference. They are alot easier to wear and apply, but they don't last more than two hours at a time and don't fade to a stain like the Mega Last Lip Colors. They are comfortable to wear and won't expose any dryness but one thing I have noticed is that these transfer so easily- to your mug, scarf etc - so you would have to take care to be extra vigilant about what you do with your mouth. I have also noticed that the red I have, Cherry Frost, whilst it is a gorgeous colour, bleeds outside of my defined lip area just a little bit which drives me absolutely potty! Again, the packaging on these does not meet my high standards, and thankfully I learned from the comments in my last post that I am not the only silly person who cannot seem to put the lid back on these lipsticks without snagging the lipstick in the bullet and taking a chunk out of it. I don't mind the plastic packaging so much but I know I would definitely appreciate if the lipstick wound all the way down! Then again, for €1.99, I feel highly cheeky for having such high expectations of a €2 lipstick (or $1 in the US if I recall correctly!). In conclusion, though I do like these and the colours are very pretty, I just never seem to bother with them because they are just too high maintenance for my day to day liking. I don't feel like I can relax into my lipstick with these because I have to check quite frequently to make sure it hasn't slid down my face or transferred to my teeth/ scarf etc. The Mega Last Lip Colors might be a bit trickier than your more conventional lipsticks to apply but once it is applied and you have the shape outlined to your liking, they are pretty easy to maintain. I don't think I'll be rushing out to pick up another one of these any time but if you have tried any of the Silk Finish lipsticks and had a better experience, please let me know below and tempt me back to the darkside! Also, if you have tried them and found that they haven't quite hit the mark for you, let me know that too!